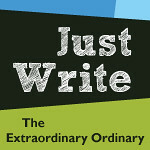 Home » just write » Just Write: The Magic of Quiet. My life is full of noise. Full of pushes and pulls. Of, “Mommy, UP”s, of “Hey, could you help me with this?”s and of “What should we have for dinner?”s. It’s full of background noise, too. The laughter of coworkers. The sing songy words of a playing child. The scritch scratches of a drawing husband. My life is full. And that is a very, very good thing. But every once in a while, after days filled with deadlines, evenings filled with tantrums, and nights filled with animals crying plaintively while plopping on top of kidneys, it all becomes too much. My head starts aching. My temper starts snapping. Sometimes, I even end up with a nasty toothache that has me calling the dentist, only to realize that it’s not a cavity…just the physical manifestation of a constantly clenched jaw. That’s when I know I need a little quiet. A little time to listen to the birds sing. To watch the flowers blow in the wind. To write in the silence of my own mind. That’s when I fire off an email to my working world and let them know that they won’t be seeing me that day. That I’ll be working hard, but invisible to them. That’s when I shuttle my kid off to school, then turn the car around and head Home. To the silence. Then I spend my day traveling from a comfy spot on my couch, to my favorite chair in the sun, to a rickety old chair at the kitchen table. I write hard. Furiously. At a pace I never quite manage at the office. I take breaks to pet furry heads, sniff flowers, and walk barefoot in the grass. And as I watch the clock tick down, it’s bittersweet. My life is noisy and full and I wouldn’t trade it for the world. But sometimes? I just need a little quiet. « Ten Things No One Tells You about Becoming a Vegetarian. 1 Comment on Just Write: The Magic of Quiet. Loved this post. It practically describes my Mondays (when I send my two off to camp from 9am-2pm). So true about how you describe the clock winding down as bittersweet.